The suggested stitch height for Christmas Poinsettia is 5" - 12". Christmas Poinsettia was designed by Lorien Quilting. Stitched out nicely. Looks very nice on a Christmas quilt. 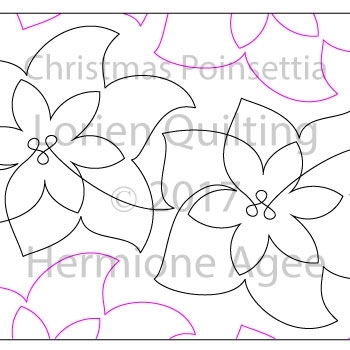 Used this design on a pieced poinsettia block quilt. The design complemented the piecing without taking over with an open and airy feel to it. I sized it slightly larger (14Ã¢â‚¬Â) than recommended to match the spacing of my blocks and it still ran well. The smallest recommended size is pretty and looked good on non pieced work, but the center circles do become rather dense at this size. Lots of points and circles so it’s important to run a test for the correct tension. I used this design on a Christmas table runner. It turned out beautifully. It has simple lines that didn't obscure my pretty Christmas fabric but gave it an elegant look.